The location was excellent, within walking distance to both Pacific Fair shopping & the array of excellent restaurants & cafes in Broadbeach. Near Broadbeach, weekend markets close to Woolworths, very close to Surfers Paradise around the corner from Pacific Fair. 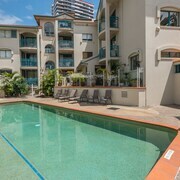 It is one of good apartments at Broadbeach; Under cover parking is good,room is comfort and walking to the beach is a pleasure. We had a short stay at the Mantra SG recently and we were very happy with its proximity to all that Broadbeach has to offer. nice Apartment, excellent view and property in a good location. Reception was great and the facilities available were excellent. Which hotels are closest to the Broadbeach airport? 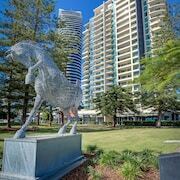 Where to stay near top Broadbeach attractions? What kind of hotels are in Broadbeach? 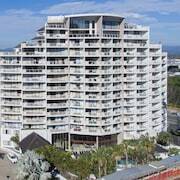 Which hotel chains are in Broadbeach? Couples looking to get away will find a romantic atmosphere in Broadbeach, and visitors give high marks for the beaches, shopping, and top-notch restaurants. This welcoming city also attracts tourists with its casinos and spas. Top sights around the area include Sea World, Warner Bros. Movie World, and Dreamworld. The city's natural setting is picturesque, including the beaches and Kurrawa Beach. Shopping is one of the favorite things to do, so consider an excursion to Broadbeach Mall, Oasis Shopping Centre, and Oracle Boulevard. 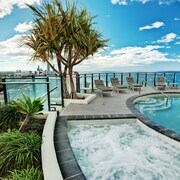 A couple of additional sights to add to your agenda are Pratten Park and Harbour Day Spa. 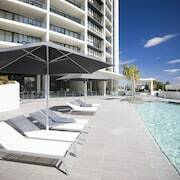 Peppers Broadbeach - With a stay at this 5-star aparthotel, guests can enjoy access to 2 outdoor pools and free parking, along with an in-room kitchen. It's a favorite with Expedia travelers for its family-friendly amenities and beach locale. 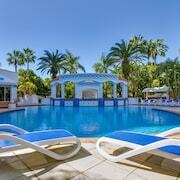 The Ritz Resort - Our customers like the beach locale and pool at this apartment. 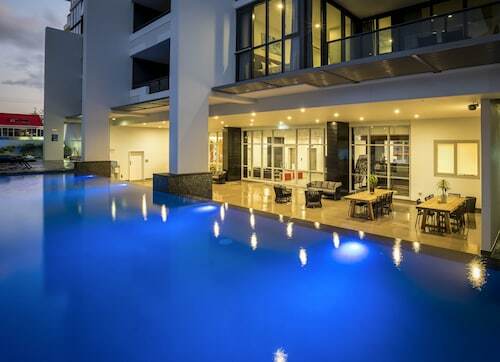 This 4-star apartment features an outdoor pool, free WiFi, and free parking. 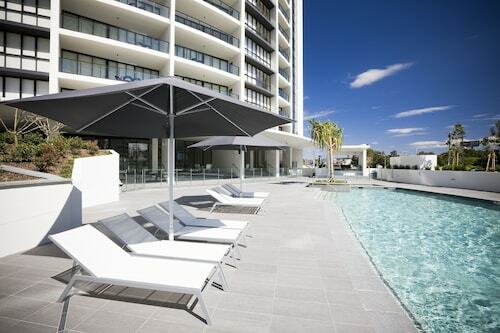 Ultra Broadbeach - This 4.5-star apartment features an outdoor pool, free WiFi, and free parking. Expedia customers like its helpful staff and proximity to shopping. Popular places to visit outside the city include Sea World, located 4.7 mi (7.6 from the heart of the city, and Warner Bros. Movie World, which is 11.2 mi (18 away. As you might guess from its name, the golden ribbons of sand along the coast of Broadbeach are a big part of life here. From surfers to beachcombers, all types of travellers feel right at home in this Gold Coast city. Often called “Broadie” by locals, Broadbeach is more than just coastline, however. During your time here you can also indulge in fine dining, peruse the Pacific Fair Shopping Center or art and crafts markets, and burn the midnight oil at a local dance club. 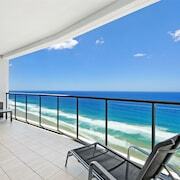 No matter what you’re keen to do on holiday, your time in Broadbeach has something to offer. 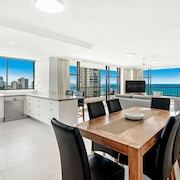 Broadbeach accommodation ranges from furnished apartments to holiday houses and upscale resorts that meet every possible need. Whether you are on a budget holiday or looking to splurge on a fine accommodation, you will find something that meets your travel style. 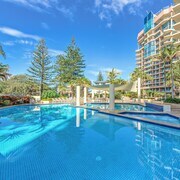 Hotels in Broadbeach have amenities including swimming pools, water parks, and private balconies. 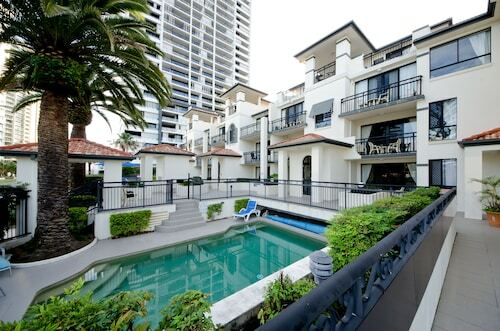 The nearest airports to Broadbeach are Gold Coast Airport (OOL) and Brisbane Airport (BNE). From either airport, you can make your way to Broadbeach by shuttle service, taxi, or a car hire booked right here on Expedia. 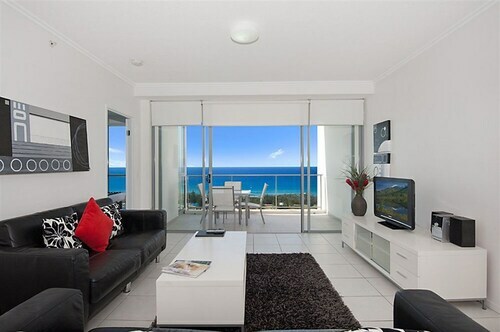 Once you arrive in the Broadbeach area, you can travel via car, bus, tram, or rail. 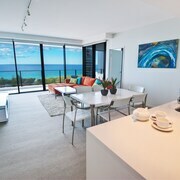 Whether you want to spend your entire holiday soaking up the sun’s rays, or become a glutton at local restaurants, your next holiday to Broadbeach starts right here on Expedia.com.au today. 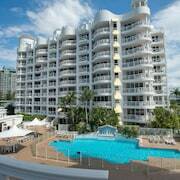 Make your trip even more memorably by booking one of the top Broadbeach hotels with us. 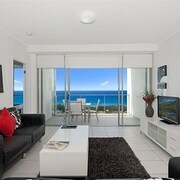 From budget-friendly digs to 5-star Broadbeach accommodation, you can find it all right here on Expedia.com.au today. Sort hotels by theme, location, or amenities, and then book without ever paying an Expedia booking fee. 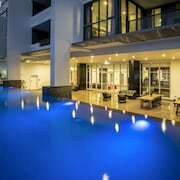 What are the most popular hotels in Broadbeach? 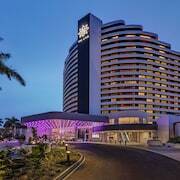 Are there hotels in cities near Broadbeach? 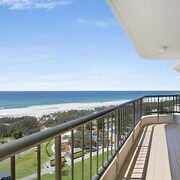 Explore Broadbeach with Expedia.com.au’s Travel Guides to find the best flights, cars, holiday packages and more!